4000 people gathered on Friday in front of the Government building to express their protest against the unjust social and educational policy of the country. 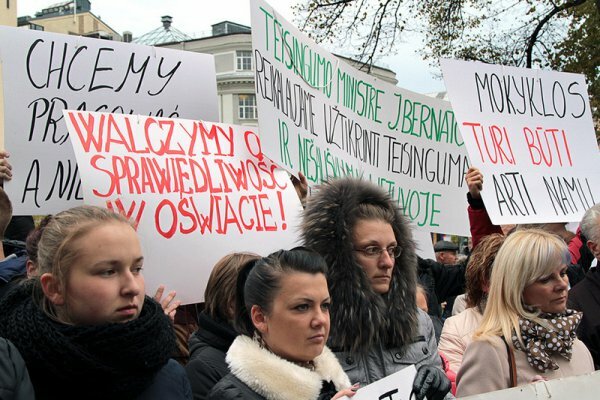 The protest was organised by the representatives of job teams, trade unions, people working in education, culture and social services as well as parents of schools of national minorities and Lithuanian schools. The demands of the picketing people were supported by the Electoral Action of Poles in Lithuania. Svetlana Juodelienė, the leader of the Educational Workers of Vilnius County Trade Union said that the model that the Government is working on will have a negative impact on those who earn the least, do not have a good education and are teachers. She referred to the model as “antisocial model”. She pointed out that trade unions are not against changes, but against those parts of the model which worsen the situation of employees, including pedagogues. Rita Tamašunienė, starost of the governmental fraction of the Electoral Action of Poles in Lithuania, said that today’s protest is a clear expression of dissatisfaction with the work of the Government. “The voice of the citizen should be heard. Trade unions and their part in the Government’s decision making process is written in the Constitution of our country” – said the MP. She added that the MPs from the Electoral Action of Poles in Lithuania proposed several projects of act amendments in which they signal to the Government that the life of an average citizen is catastrophically bad. Young people are emigrating in despair while the authorities are handing out „colourful fliers to the refugees who do not want to temporarily live in our country even in the face of war”. “Shame on the Government which is occupied with getting popularity and is exploiting people’s patience by putting off the better life in our country for later” – said the MP. Iwona Matwiejko, the headmaster of kindergarten in Maišiagala spoke about the situation of kindergartens. “We have run out of patience. For many years, we were hoping that our salaries will rise. Of course, we finally got a couple percent more, but the officials must have missed the fact that our salaries were only a couple of euros more than the social benefit which is 303 euro. The form mistress earns 400 euro” – said Matwiejko. She turned to the authorities to consider the pay rise for kindergarten teachers because „if we are going to strike, you will see not two thousands but hundreds of thousands discontented parents”. MP Irina Rozowa calls the model of social politics prepared by the Government a straitjacket which will cause an employee to be even more dependent on the employer. “The new model is aimed at granting more rights to the employers than to employees” – said the MP. Jan Gabriel Mincewicz, who has a Ph.D. from theology, mentioned the old problems about which the national minorities have been talking for over 20 years while the country still does not hear them. It is about more financing of national minorities schools. The actions of capital’s authorities which do not want to give accreditation to Polish schools in Vilnius, especially the changes in decisions concerning the Konarski school, he called “psychical molestation of children and their parents”. MP from the Electoral Action of Poles in Lithuania, Zbigniew Jedziński, emphasised that the model which is being prepared by the Government constitutes a threat to working people. In his opinion, if the authorities are going to continue acting in that manner, the only working people left are going to be the Seimas, the Government, the army and the police. Everybody else will escape the country. Even refugees do not want to live in Lithuania. MP from the Electoral Action of Poles in Lithuania, the leader of the Association of Polish Schools Teachers in Lithuania „School Matrix” Józef Kwiatkowski broached the topic of education of national minorities. He stressed that national identity is one of the most important values our children should keep and that it can be guaranteed only by the school with mother tongue as the teaching language. “It is why we demand that schools of national minorities acquire the status of national minority school, the mother tongue gets a deserved status, the national exams are held in mother tongue, the subject of history of the motherland is introduced” – said the MP. Renata Cytacka, councilwomen of the Vilnius City Council and the representative of the Forum of Parents of Polish Schools in Lithuania mentioned the topic of national minorities education in Lithuania which state is, according to the Prime Minister, the best in Europe. “In that case I would like to ask our Prime Minister: what have you done for us [national minorities]? Did you contribute to the opening of even one kindergarten? Did you help with the school system, for instance with the famous 2011 Ecudation Act?” – asked rhetorically Cytacka. She pointed out that the educational reform is destroying the education of national minorities in Lithuania. Towards the end of the 1,5-hour long protest, the leader of the Electoral Action of Poles in Lithuania, MEP Waldemar Tomaszewski gave his speech. He thanked everyone who did not let themselves be intimidated and came to protect their rights – the right of mother tongue education and the social rights which the authorities want to restrict. “Today, there is a lot of intimidation in the society. Even while walking on a main road of our capital, one cannot really see smiling faces. It is getting more and more difficult for people to live and the authorities are talking about how to pay 800 euro for refugees, how to help the entrepreneurs for them to be even easier to fire their employees” – said the leader of the Electoral Action of Poles in Lithuania. He stressed that today’s protest took place on a day when 37 years ago St. John Paul II was made pope. “When he visited his motherland, the first words he uttered were: “Do not be afraid! (…) We should not be afraid today as well!” – said Tomaszewski. He emphasised that the citizens of Lithuania cannot lead a life worse than other Europeans. “The new social model will lead to restriction of the rights of employees even more. It is unacceptable! It is very meaningful that when nobody dares to protect employees, national minorities – Poles, Belarusians, Russians – are putting Lithuanians together to jointly protect their rights and social guarantees” – said the leader of the Electoral Action of Poles in Lithuania. The organizers of the protest, the representative of educational communities and trade unions handed in a petition with the demands of the protesters to Rimantas Vaitkus, the chancellor of the Government. Will the Vilnius region have Polish television?